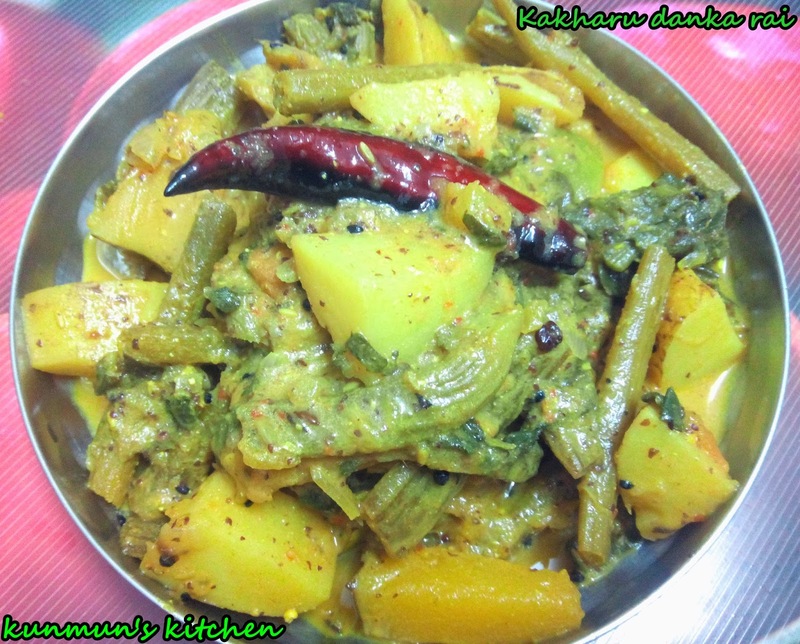 Its a typical perfect Odiya cuisine. You can have it with hot steamed rice and enjoy the flavour of the mustard paste. Green Chilies - 2 nos. Dry Red chilies - 3-4 nos. Soaked this in 1/2 tsp vinegar for about 15 minutes n grind to make a very fine paste. Wash and cut all the veggies, Put 1 tsp oil to the kadhai. Add cumin n mustard seeds, when they splutter, add all the veggeis except brinjal and stir fry about 5 minutes. Add the mustard paste and saute. Add 1 cup water, brinjal, salt to taste, haldi and cover it. Let it cook for 10 minutes in medium flame. When the veggies are semi cooked, add Pumpkin leaves n chopped tomato and mix it. Again cook for 5-8 minutes and remove form heat. For tempering, Add oil to the pan / kadhai. Add dry red chilly, Panch phutan when it start to crackle add the chopped onion and saute for a while. Add the cooked veggies to the tadka n boil for 2 minutes. Switch off the flame and Serve hot with rice..